Russia is taking back World War II-era tanks from Laos because, well, Moscow needs a star, lots of them. The Russian Defense Ministry said this week that 30 T-34 tanks had arrived in the far eastern port of Vladivostok after a 4,500-kilometer (2,800-mile) journey from the Southeast Asian nation. They soon will be on their way to the Moscow area. 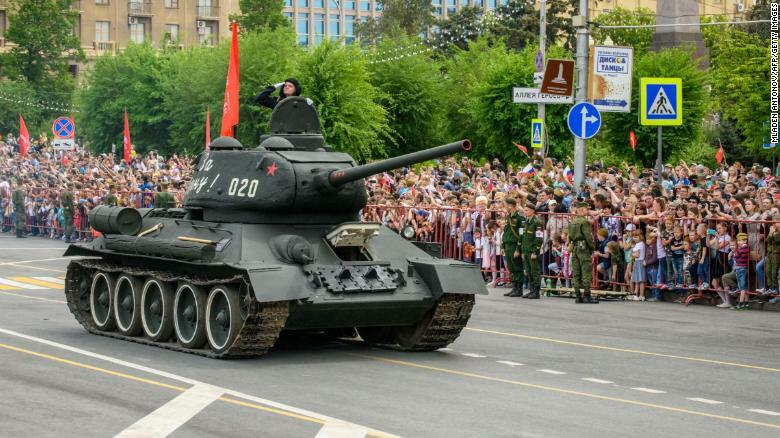 The T-34 was the backbone of Soviet armor in World War II and beyond. "No tank affected the outcome of World War 2 as the Soviet T-34 Medium Tank series," according to the militaryfactory.com website. Some 57,000 were built before the war ended in 1945, a number so large that "availability in numbers certainly played well for the Soviets as T-34s could swarm enemy positions seemingly at will," militaryfactory.com says. And while the Soviet Union and then Russia have produced more modern tanks since, the T-34 holds a strong place in Russian hearts. And that's what led to the need to bring the 30 back from Laos. Russians, it seems, can't see enough of them. "The equipment transferred by the Lao side is planned to be used during the Victory Parades in various cities of Russia, for updating museum exhibits, as well as for making historical films about the Great Patriotic War," the Russian Defense Ministry said. And if you need any more evidence of that need and popularity, a feature-length film about Soviet soldiers and the tank, titled "T-34," broke Russian box office records last week, according to news reports.